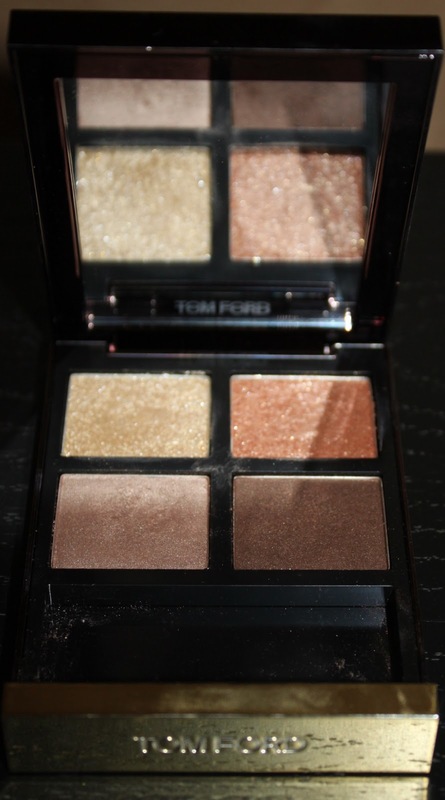 I have really come across some impressive products this year, Tom Ford being one of them. If you are a frequent reader of beauty blogs you will be aware that some adore and some are really adverse to the brand. Ok, so I am definitely on the adore end of the spectrum and for many reasons. Before I review Golden Mink, here are my thoughts on the subject. Many have stated that the price versus the quality is just not there. In my personal experience I have found these shadows to be have the modern edge of Nars together with the texture that exceeds that of the best. The quads come in interesting colour combinations, with different textures and effects. I have only received compliments when wearing my Tom Ford Quads. They are expensive and not everyone can afford such a luxury or choose not to indulge. However, you are getting four large size pans in a compact. I think if you had to compare this to a Bobbi Brown filled 4- pan compact, you would be surprised how comparable in price they would be. 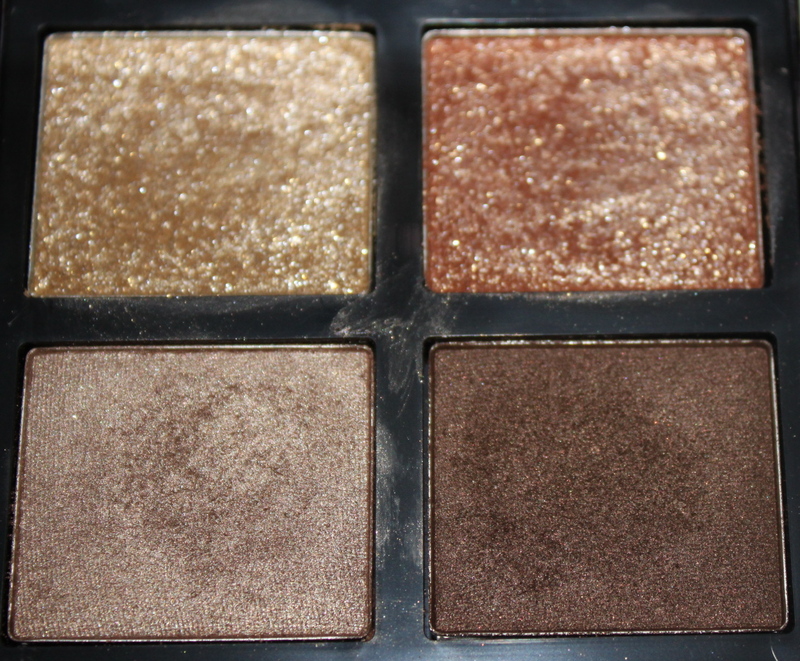 I feel that the quality of these shadow are one of the best, with them being long-wearing and well pigmented. I love the burgundy brown compact which is elegant and well made. There are two double ended brushes inside with 3 various sponge tips and one brush. I used them successfully to create a basic everyday look. I have to keep reminding myself that I have other good brands in my stash, as I have continually worn them since I got them about four weeks ago. Please excuse the pictures with the product already been used, but I bought these in London and could not resist before getting home and photographing. The top left shade is a champagne fine glitter, which is best applied with your finger in a pressing motion. This is to reduce fallout and get good adherence to your lid. This shade is pigmented and glittery all in one. The next shade on the top right, is an unusual gorgeous ginger shot through with glitter. 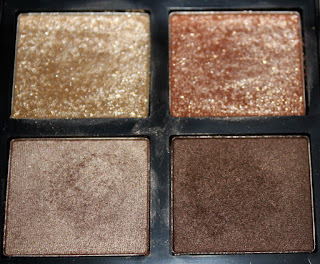 It is very similar to one of the shades from the Shu Uemura Chocolate Donna palette. The bottom left shade is a buttery, soft beige taupe, which is perfect for all over your lid. The last shade on the bottom right is a medium brown with a satin texture. this works well to line, deepen your contour, add depth to the outer corner of your eye. As you can see from the swatches below, this quad takes neutrals and makes them fun again. My *ordinary* brown eyes now seem more alluring. I have shied away from neutrals, as I deemed them boring. This has peaked my interest in the beauty of a neutral eye. Brown eyes seem more luscious and inviting. This will frame both blue and green eyes as well. My feint green flecks seem...... MORE. Overall, I can only sing the praises of Golden Mink. If you have any celebration coming up, this is would be on top of my wishlist. Golden Mink is also a good entry into the world of Tom Ford, as it is wearable for day and evening looks (glitter in the day- YES- just trust me). Tom Ford- worth the money- I would love to hear your thoughts? After reading your comments on Tom Ford Make-up I will definitely have a look at them when I'm in Hong Kong.The Golden Mink colors are lovely.